Seeme & Liz > Parenting Tips (0-2 year olds) > 12 Play Activities For A 1 Year Old That Require Little To No PREP! 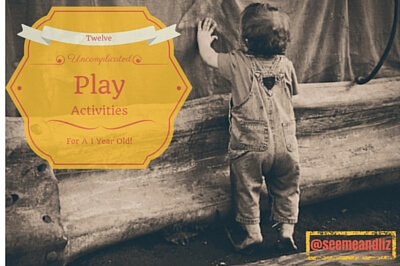 Recently a reader asked me for some ideas for play activities for a 1 year old. My plan was to give her the link to one of my articles, and then I realized that I haven’t actually written anything specific about this topic. I do have an article called The Best Learning Toys For Babies To Encourage Language Development, which is geared to 6-24 month old’s, but it is specific to toys that will help with your child’s development. 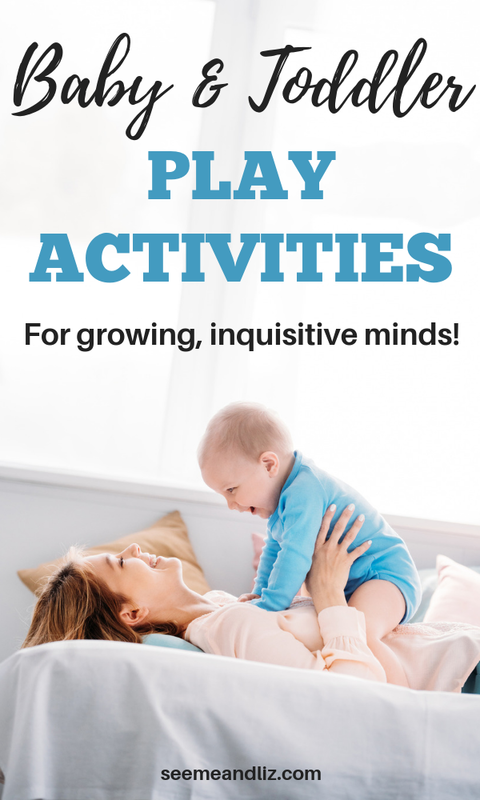 So, I decided I better write a more specific article geared towards play and a 1 year old because if one person is looking for fun ways to play with their 1 year old then I am sure others are looking for this information as well. Luckily 1 year olds are easily entertained! By the end of this article you will be thinking “wow, these ideas are so simple, why didn’t I think of that”. Some of these activities will require your involvement while others can be done by your little one independently. It is good to encourage independent play from a young age so that your child can build problem solving skills, reasoning and independence. For the activities that require your involvement make sure to provide your little one with a language rich experience. Talk about what you are doing and label the objects you are using! A child’s vocabulary and early language skills are one of the best indicators of future success. Simple Play Activities For A 1 Year Old! Cardboard is fun for kids of all ages! It really sparks their creativity and imagination. However, with a 1 year old, it will be more about exploring the cardboard and even trying to rip it or stomp on it. Find a cardboard box that is open at the top. Get some tissue paper and crumple it into balls. Have your little one do this with you. Then start throwing the crumpled tissue paper into the box. Once it’s full your child will have a great time dumping out all of the tissue paper and starting again. Talk about what you are doing “throw it IN the box” “let’s take it OUT of the box”. Don’t worry about repeating yourself, you are the only one it will sound silly too. If you have a larger box, let your child sit in it while you push him around the house making sounds such as “vrooom, beep, wee”. Talk to your child about driving in a car. Crash into a wall (gently of course) and say “uh oh”. Your little one will soon start repeating these simple sounds and words. Why not hand over some crayons and marker and let her decorate his car! I know this is all about fun with cardboard, but if you don’t have a box a laundry basket makes a great substitution! Turn a cardboard box upside down, grab a favorite toy of hers and hide it under the box (while she is watching). Pause and wait to see if she goes to the box to find the toy. If she does do this she is demonstrating the basics of object permanence. 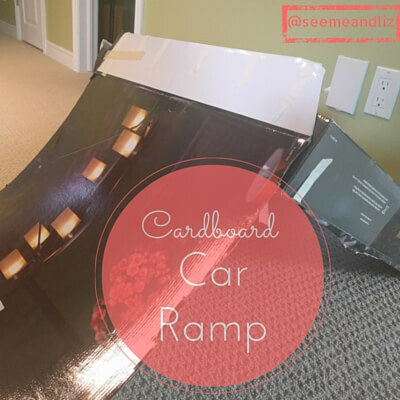 Turn a cardboard box upside down and add another piece of cardboard that is angled from the top to the bottom to make a ramp. Give your child a toy car to put on the top of the box and then give it a push and watch it drive down the ramp. Talk about the car going up the ramp and then driving down the ramp. My son used to love this and could do the same repetitive movement of pushing the car up the ramp and watching it go down for a good 30 minutes before he became bored. Children this age love ball pits, but so do older children! Watch your child smile and giggle while sitting in a ball pit. You can purchase one like the one pictured below. Or if you have a pack n play get some balls like these and throw them in. Be prepared for balls to go flying everywhere, but remember, you child is developing fine and gross motor skills while grasping, releasing and throwing the balls! You can even get your child to help you clean up after she is done playing by throwing the balls back into the ball pit! If you have one like the one in the picture, she can practice trying to get the ball into the basket! Young children love tactile experiences. Sing songs such as “This Little Piggy”, “5 Little Ducks”, “Itsy Bitsy Spider” and “The Wheels on the Bus” where you can touch his fingers or do actions with your hands. Your child will love hearing you sing while looking at your actions. Don’t worry if you don’t have a great singing voice, your child will still love it! Finger plays and songs with actions help to build language and vocabulary, fine and gross motor skills, memory and hand eye coordination. In no time your child will be doing the actions herself! As I said at the start of this article, 1 year olds are mesmerized with the simplest activities. And this is another one of those activities. All you need is a muffin tin and some plastic balls. The ones meant for ball pits work well! Show your child how you can put balls into the muffin tin. Gently shake the muffin tin back and forth. Then dump the balls out, gather them up and put them back in again. You might not even need to show your child all of this. He will figure it out pretty quickly and most kids can stay with this activity for 15 minutes or longer. Babies and toddlers thrive on repetition. They also need a lot of repetition in order to learn new skills. You will need to carefully supervisor your child for this one because you don’t want him eating the shaving cream. However, this is a great sensory activity, so don’t let the possibility of eating shaving cream scare you. Just make sure to pull your child’s hand away from her mouth if she tries to taste it. Try saying “yucky” each time you do this. But be warned, this might become a game for some children as they love getting a reaction (positive or negative, unfortunately most kids don’t differentiate between the 2) from their parents. All you need for this is a cookie sheet and some shaving cream. Spray shaving cream onto the cookie sheet and let your child draw in the shaving cream with his finger. This is a great activity to work on finger isolation for children who are having difficulties with pointing (which is a skill needed for joint attention). If you are really against using shaving cream due to the possibility of it being ingested, you could make some mousse as it has a similar texture and consistency to shaving cream but can be eaten. Or try finger painting with food, it’s the next section. This is similar to the cookie sheet and shaving cream activity, but using pureed food and a piece of paper. You can either puree food yourself or purchase jars of baby food. Try to find some different colors of food such as carrots (orange), peas (green), prunes (purple), etc. Get your little one set up in her high chair and place a piece of paper on the tray. Next put a tablespoon of one of the purees onto the paper. Encourage your child to use his hands and fingers to draw. Make sure you are narrating and talking to make this a language rich experience. Talk about the color being used and how it feels (squishy, wet, cold). Add more purees to add a variety of colors to your child’s creation! This can also be a good activity for a picky eaters as it allows them to explore food in a playful way! I know this isn’t exactly a “play activity” but it is something that 1 year olds love. For really active children you may need to wait until nap time or bedtime to read together. Reading together is a great language building and bonding experience. Talk about the pictures in the books. Label simple words such as animal names and common objects. Ask your child questions that you feel she can answer through pointing or words. For example “where is the cat?” Your child can either point to the cat or say “there” or “cat” while pointing. If you are using a book with repetitive words and it’s a book your child is familiar with, pause before saying one of the words that is frequently repeated. See if your child will try to say the word herself. Make sure to check out the Indestructible book series. These books can be pulled, chewed and drooled on and they will survive. Many of the books in the series have only pictures (no words) so you can tell your child new stories each time you “read” these books together. This is similar to the cardboard box turned upside down but you use a clear container instead. It needs to be a container that is fairly wide at the top because you want to cover the bottom half of the container with paper so that you can only see in through the top half. Place a pompom or any other small object into the container and then put the lid back on. Watch as your young child is amazed as the pompom “disappears” into the bottom of the container and then reappears when he turns the container around. For full instructions with pictures, click here. I have to admit that when my children were around 7 and 9 they pulled the salad spinner out themselves and got pretty creative with it! So a one year old should be fascinated for quite some time. Model placing items into the salad spinner. Name each item that you are putting in, assuming they are toys and not cotton balls or pompoms, although you could label these as “ball”. Then put the lid on top and show your little one how to either spin the handle or push it down (depending on the type you have). Say “push” and “spin” during this activity. Keep repeating it with different items. Activities for One Year Old’s Do Not Need To Be Complicated! As you can see, there are so many simple activities that will amuse a young child. Most of the ones I discussed can be quickly put together with household items, so you can put your wallet away! I am sure based on this list you will be able to come up with even more ideas on your own. Remember, what may seem simplistic and boring to an adult is a great learning experience for a baby and toddler! Thanks for this article! My sister has a one year old, so I’ll be sure to share this with her! These look like some solid activities for the little ones. The one that I like by far is the ball pit. My nephew’s birthday is coming up and I think he would love a ball pit too! My sister sometime seems overwhelmed trying to keep up with what is best for her child. She will love hearing that simple activities are still recommended! You’re welcome Parmi! Ball pits are a hit with all children. In fact, my nine and eleven year old still love them! The only issue is little kids love throwing the balls out of the pit so that parents can pick them all up. But that is part of the fun! I hope your sister enjoys these activities with her one year old. Ah tape, I should have included an activity with tape Loes! My son is now 9 and is still obsessed with taping everything together and making cardboard creations! Thanks for sharing! My wife and I have always loved to read to our kids – I in English, and she in French. Our youngest is now 4 and in school, and his interest in books has simply exploded! I take him to school on public transport, and we search out our little space, usually in the back of the bus…and indulge. Our two oldest are now 11 and 9, and are at the stage where they tell me and mommy about what they’re reading. Their habit has been a nice counterbalance to the video game tsunami engulfing just about every kid everywhere, including ours. I’m not sure they would have been such keen readers if they hadn’t been read to extensively as little tykes. Let me take this opportunity to send a shout out to their 2 grandmas, who read to their grandkids at every opportunity. Yes. it takes a village! That’s great Norman! I wish my kids loved to read as much as I do. But unfortunately they don’t. My husband and I (and both sets of grandparents) have read to them since they were babies. Hopefully one day they will end up loving it! What fun ideas to keep a baby entertained. Your article brought up a memory from years ago. It was Christmas and we couldn’t find one of my daughters. We looked outside and she was inside a cardboard box. She played in that box for a good hour or more, while her unwrapped Christmas toys received no attention. We’ve laughed about it for years. You never know what a kid is going to be taken with. I especially like your salad spinner idea. I’m going to have to use that one in the future. Great post – thank you! Thanks for sharing Holly the story about your daughter Holly! Young children really do like the simple things adults take for granted! I don’t think I have ever met a baby or toddler who didn’t prefer the box a toy came in over the toy itself! I love your article! Oh the old paper box, isn’t it amazing how children love them. Honestly, my cats love a cardboard box too. Who needs all those expensive toys when a box will do the trick. 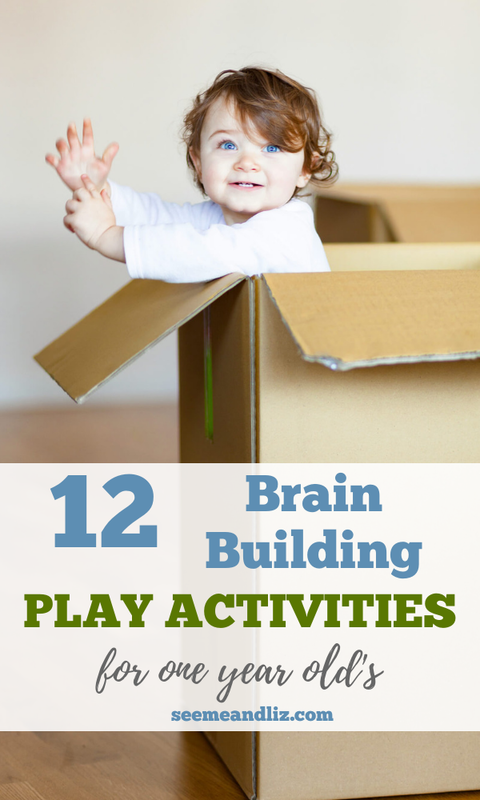 I have a 1 year old grandson and I am going to try all of these play time activities with him. I love watching a child at this age and how amazed they can be and totally fascinated with the simplest things. 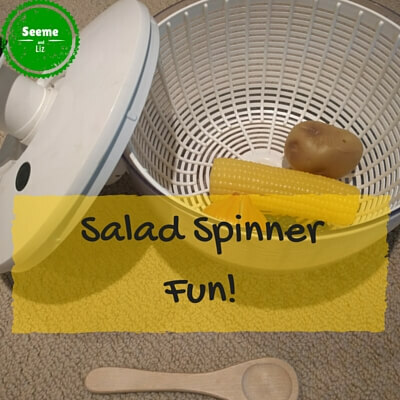 One thing I have never thought about was using a salad spinner but I can see how that would be very exciting for a youngster! And I have to say that nothing is as pleasant as reading to a child. They get so engrossed and it is so sweet to see their concentration on their face as they watch and listen. I am also going to show your article to Jamison’s mom and dad. I know they will enjoy it as well. Thank you for sharing this lovely article! Thank you! There are so many play activities for babies and toddlers that you can create with house hold items! I remember my mom taking out tupperware containers and a few pots and then handed me a wooden spoon and let me create music. I can still remember sitting on the kitchen floor making music! My youngest is 12, many of these bring back some good and some not so good memories. These definitely kept my children busy for hours on end. I like how you have described how each activity stimulates a certain part in the child’s learning. My oldest child is a father now, it’s good I found this website, as I can pass it on to him. Thanks Jagi! Hopefully your son will find this site helpful! Having toddlers around to care for is never an easy job as they can require so much attention which sometimes hinders us getting through our chores. I find this post very informative as I have now discovered new ways of keeping my toddlers busy while I get some work done. Keep up the good work as this will help many parents in raising their kids during the toddler stages. Yes, toddlers sure are busy. They have so much learning and exploring to do! It is better for their development to learn necessary skills for success later on through play than through electronics! So keep those cardboard boxes and watch your little one explore and learn in a hands on way! Ah, the old cardboard box. Who hasn’t driven a cardboard car as a youngster. You can even put a few together and make a fort or a tunnel for the toddler. That is nice that you came up with ideas for a 1 year old. Wow, finger painting with food? I never would have thought of that, but at least they could eat some of that and you don’t have to worry about it. Thanks for your comment Kevin. The list of things you can do with some cardboard boxes is almost endless. I know we always tell kids not to play with their food, but I think a few exceptions can be made in the name of learning and exploration!